Last week the U.S. Bureau of Labor Statistics released national price data, which showed that egg prices were up 7.7% in December, and 10.7% over the past year. The American Institute for Economic Research attributes the price hike to two factors: (1) the avian flu in Mexico, which reduced that country’s domestic supply and increased demand for U.S. eggs, and (2) new regulations in California, the fifth-largest egg-producing state in the U.S., which now requires that hens have enough space to stand up and turn around, thereby increasing costs. Both of these reasons should make the increase in egg prices temporary, but for now, the egg cartons at the grocery store come with higher price tags. Before you panic about the increasing cost of your omelette, there is hope! Especially if your ingredients include cheese or milk. That’s because the cost of milk is dropping. According to the Associated Press, milk sales set records in 2014 but due to overproduction the prices have fallen and are expected to continue to drop through 2015. 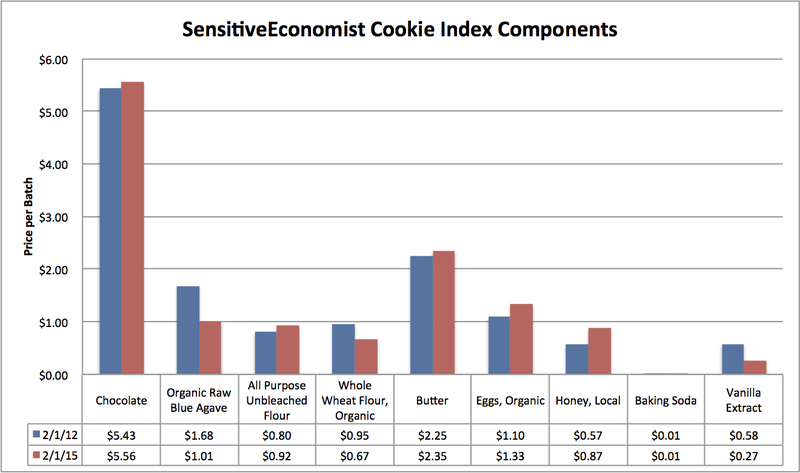 So how does all of this news affect the SensitiveEconomist Cookie Price Index? The price per batch in February 2015 is down 3% overall compared with February 2012. Prices for agave, whole wheat flour, and vanilla extract have decreased; while prices for the chocolate, all purpose flour, butter, local honey, and eggs have all risen. What’s a SensitiveEconomist to do with all of this information? Make cost-sensitive and refined sugar free cookies, of course! 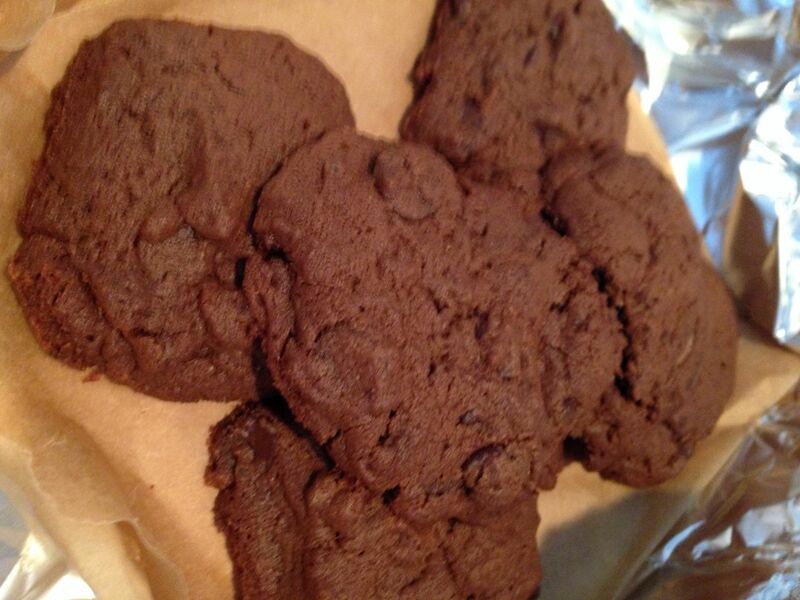 I used Ellie Krieger’s recipe for Triple Chocolate Cookies, with some modifications. I substituted the cane sugars with coconut palm sugar and maple syrup (agave would work fine here too). I avoided using honey because its current price is high relative to the other sweeteners, according to my price index. Since whole wheat flour was less expensive than the all-purpose variety, I used more whole wheat and less all-purpose. And unlike my Chocolate Chip Cookies, on which my price index is based, this recipe only calls for one egg. Enjoy the chocolatey cookies with a glass of milk…while the price of a gallon is still inexpensive! In a large bowl (or using a stand mixer), mash together the butter and palm sugar/maple syrup with a fork until well combined. Add the oil and egg and beat until creamy. Mix in the vanilla. In a medium bowl, whisk together the flours, cocoa powder, and salt. Add the dry ingredients to the wet ingredients and mix well. Stir in the chocolate chips and the (optional) pecans and mix well. Using a tablespoon, scoop the batter onto an ungreased cookie sheet. Bake for 12 minutes. Transfer cookies to a rack to cool. Happy June everyone! Or perhaps not so happy after yesterday’s unexpected jobs report from the U.S. Department of Labor. Analysts were disappointed to see that only 69,000 jobs were created nationwide in the month of May and the unemployment rate rose to 8.2%. This information shows that the nation’s economy continues to recover ever so slowly from the recession that ended more than two years ago. However, there is a glimmer of hope, particularly for economists who also like to bake cookies. I just calculated the 2012 Q2 SensitiveEconomist Cookie Price Index, which shows a drop of 17% from the previous quarter. Thanks to decreases in the prices for organic whole wheat flour, agave nectar, and grain sweetened chocolate chips, the price to bake a batch of my chocolate chip cookies declined from $13.37 to $11.40. The only ingredient that saw an increase in price (of 4%) was the local honey. This price index result is running contrary to the latest U.S. consumer price food index, which saw a 0.2% increase in March. However, if we take a deeper look at the components of the U.S. index, there are similarities. The U.S. index saw prices for fruits and vegetables, cereals, nonalcoholic beverages, meats and eggs, and other miscellaneous items all increase – yet those foods (except for the eggs) are not included in the recipe for the chocolate chip cookies. The U.S. food index component that saw a decrease was dairy – which is included in my recipe as butter. The U.S. index does not track the prices of many organic or natural ingredients like agave nectar – so that is why the indices diverge. 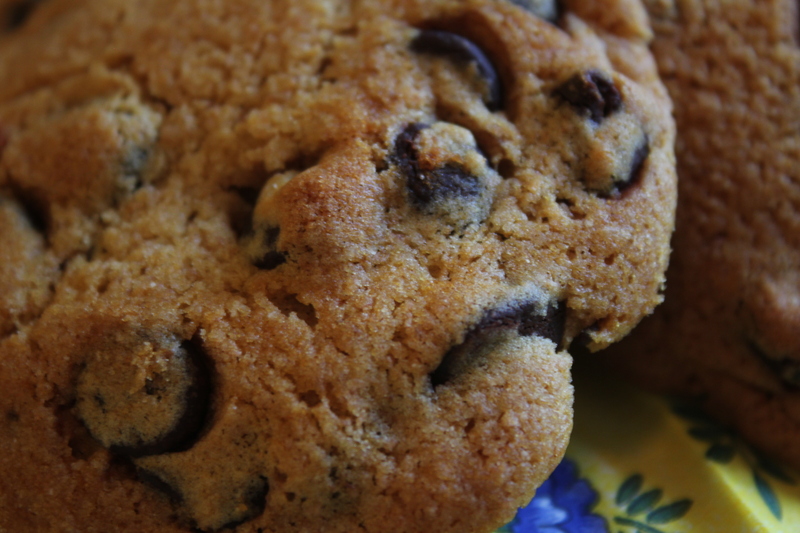 Speaking of cookies…thanks to everyone who participated in my dessert poll, either at the CTVegFest or online. I tallied the 54 responses and have declared that Ice Cream is the favored dessert of the respondents, garnering 25% of the votes. This was followed by Cookies with 19%, Brownies with 15%, and Pie with 13%. For all of you ice cream lovers, there are two good recipes on this blog: one that requires an ice cream maker (Peach Ice Cream) and one that does not (Banana Chocolate “Ice Cream”). These are great to try as summer gets into full swing. 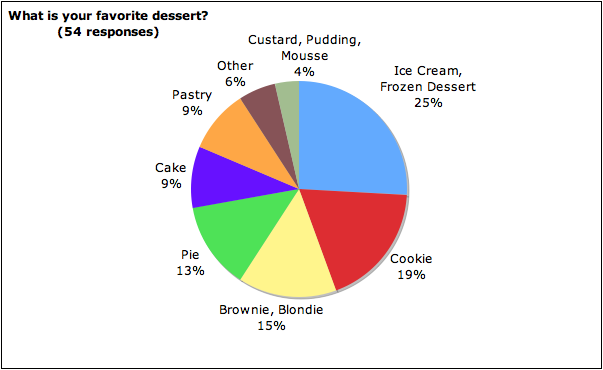 Now it is time for a new survey question: what is your favorite dessert flavor? Please participate by visiting my blog’s home page, clicking on your favorite dessert flavor, and clicking “vote.” Is chocolate really the king of dessert flavors? Or will strawberry, mint, or another fine flavor win in the end? I look forward to seeing what emerges from the data. I am sometimes asked to name my favorite economic indicator. Don’t get me wrong – this does not come up in conversation all that often, although sometimes when a group of economists get together they talk about these things. I am not sure that I could pick my absolute favorite indicator although I am partial to the Consumer Price Index (CPI). Why? Well, the CPI measures the change over time in the prices paid for a “typical” group of goods and services. The CPI is a signal of inflation in the economy and is used for adjusting dollar values and cost of living calculations (including Social Security benefits). In order to calculate the CPI, the U.S. Bureau of Labor Statistics surveys thousands of households across the country regarding how much they pay for items including food and beverages, housing, apparel, transportation, medical care, recreation, education and communication. It’s a good way to get a general sense of inflation, however I decided that it was time to add a SensitiveEconomist touch and create my own price index based on common ingredients that I purchase for my favorite foods. The first Cookie Price Index shows that it costs $13.37 to bake one batch of these fabulous, delicious chocolate chip delights (about 32 cookies)! That’s less expensive than buying cookies from a bakery or specialty shop. It will be interesting to see how this tracks over time and if it corresponds at all with the federally-published price indices.